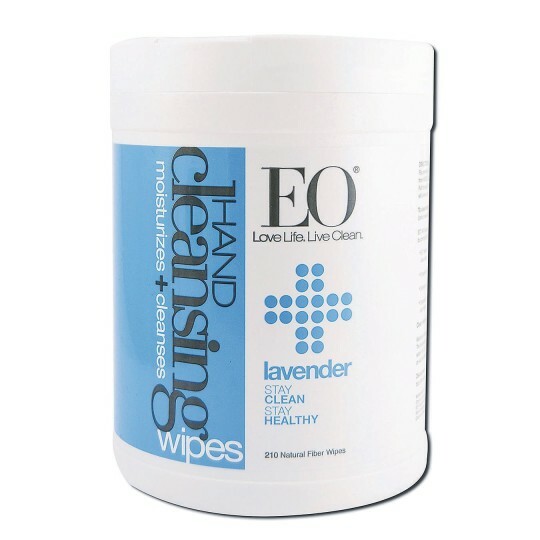 EO all-purpose sanitizing wipes clean and sanitize hands and other dirty things! 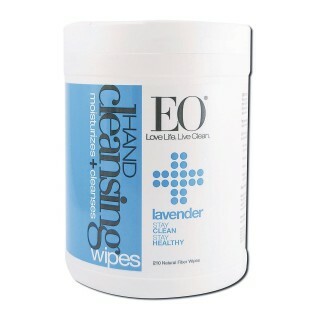 These wipes are the organic, plant-based alternative to chemical-laden wipes with the added aromatherapy benefits of organic lavender essential oil. You get 210 biodegradable wipes that are ideal for use on countertops, hands, remote controls, doorknobs, shopping cart handles, and more, to disinfect and prevent the spread of germs. Contains 62% Organic Alcohol (non-GMO) to sanitize on contact. Uses Organic Alcohol, Purified Water, Organic Lavender (Lavandula Officinalis) Essential Oil (which is naturally cleansing and soothing), Vegetable Glycerin, and Dimethicone (silica-derived moisturizer). Supports sustainable agriculture. Not tested on animals. Made in the USA. Ingredients 62% Organic Alcohol (non-GMO), Purified Water, Organic Lavender (Lavandula Officinalis) Essential Oil, Vegetable Glycerin, and Dimethicone (silica-derived moisturizer).